Every Canadian is well-acquainted with snow and ice and all things winter. Just because you are familiar, does not make you friends! 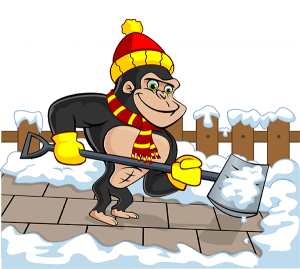 When you find that the snow and ice have outworn their welcome, call in our Gorillas. Our Mission snow removal and salting is here to save the day! Snow clearing might seem basic. So basic, in fact, that we are often asked “Why call a service when I can do it myself?”. Managing Mission’s erratic weather is a full time job. Chances are that you do not have all the necessary time or energy to devote to proper winter maintenance. After you finish a long work day, the last thing that you want to do is spend your evening stooped over a shovel – and we don’t blame you. Lucky for you, our Gorillas are masters of manual labour! Rigorous training programs prepare our Gorillas for anything that nature might throw at us. The first step to proper snow removal is assessment. Each property that we visit has its own individual quirks and needs. Trained eyes can identify the problem areas that collect snow and ice, creating dangerous ground for slips and falls. When it comes to keeping your property clear of snow and ice, you have a big responsibility. The spaces around your properties are communal, whether you realize it or not. Whether you are dealing with a standard home or business, sidewalks and walkways need to be safe and passable. Instead of waiting for snow to fall and ice to form, our Gorillas look to the future. By monitoring incoming storms and weather patterns, our technicians are ready for anything. More often than not, heavy snow falls come during the late hours of the evening or early hours of the morning. It can be a rude awakening to open your front door to a pile of snow and that is why our Gorillas are working 24/7 on our Mission snow removal and salting services.